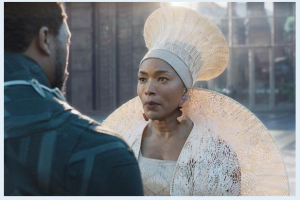 Black Panther's Queen Ramona Impressive 3D Printed Costume Pieces - 3D Prototype Design, Inc. 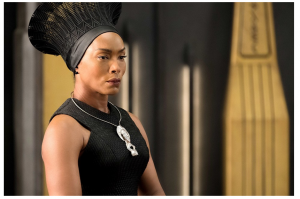 While watching Marvel’s Black Panther film over the weekend, I immediately spotted the unmistakable 3d printed pieces worn by actress Angela Bassett. Before I even left the theater, I was consulting Google to confirm I was right. Not only that, there were many other costume pieces throughout the moving that were able to take advantage of 3d printing’s impossible and custom achievements. As 3D Prototype’s ‘3D Printing Expert’ and having a vast knowledge of the method of SLS (Selctive Laser Sintering) process that we specialize in… it was easy for me to see how it was made. Here’s what tipped me off… the insane amount of detail COMBINED with the rigidity of the items! As SLS uses nylon material, it would be not only the process that could capture this kind of detail but also the only one durable and light enough to wear. With a proper CAD file drawing, there are unlimited design possibilities with 3D Printing, however, this isn’t for someone simply with a vision. You have to make the design FIRST in a 3D CAD file, which would require a mechanical engineer or designer who knows how to use the software and has an understanding of the technical details in what the abilities and limitations of 3d printing hold. These pieces featured in the film likely took hundreds of hours to design, draw and prototype multiple times before they ended up with the final pieces you see in the movie.